Released this week, the photo shows Curiosity in the middle of the dusty, red Martian terrain, with Mount Sharp in the background. 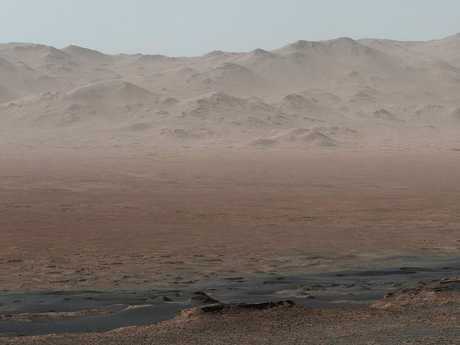 It gives us an unprecedented look at the Gale Crater, and was taken from high up on the Vera Rubin Ridge. Curiosity's Mast Camera, or Mastcam, took images of its panorama while the rover paused on the northern edge of Vera Rubin Ridge. SPECIAL REPORT: If we invade Mars, will we kill it? The mission has subsequently approached the southern edge of the ridge and examined several outcrop locations along the way, NASA reports. Dozens of pictures were used to create the image, which spans many kilometres. Last week, the Curiosity team on Earth received new images from the rover through a record-setting relay by NASA's MAVEN orbiter that surpassed a gigabit of data during a single relay session from Mars for the first time in history. The team is preparing to resume use of Curiosity's drill for acquiring powdered rock samples to be analysed by laboratory instruments inside the rover, more than a year after the most recent of the 15 times the drill has pulled sample material from Martian rocks. 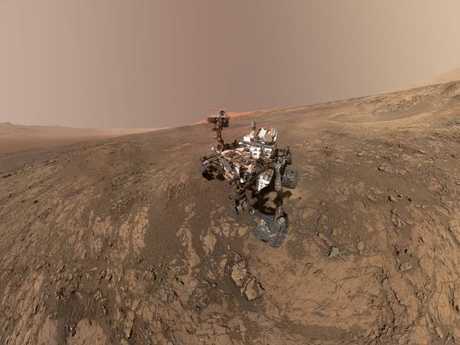 NASA's Andrew Good said: "When Curiosity landed on Mars five years ago, the team's intention was to study lower Mount Sharp, where the rover will remain for all of its time on Mars. "The mountain's base provides access to layers formed over millions of years. "These layers formed in the presence of water - likely due to a lake or lakes where sediments accumulated, which formed these layers inside Gale Crater." Curiosity has been roaming Mars since 2012. Its next stop is the slope shown in the self-portrait, where it will probe what's believed to be clay-rich soil. The Curiosity is NASA's longest running rover, and has travelled more than 45 kilometres since 2004. It's currently exploring the Perseverance Valley - where the new pictures were taken - which is a giant channel that scientists say was likely carved by a fluid.